It isn't often that a film comes along that truly defines a genre, and it can often be difficult to establish those that do; but in the case of the science-fiction genre in particular (something that was briefly debated in my review for John Carter earlier this year) if you were to select two genuine genre defining films that have shaped the sci-fi films that we see today, then you'd almost definitely be left with Star Wars, and Ridley Scott's 1979 film Alien. Now Sir Ridley has returned to the Alien universe that he created 33 years ago with his prequel that's not a prequel (I'll try my best to clear this up in a bit! ): the long awaited and highly anticipated Prometheus. The year is 2085, and a group of scientists and explorers who have discovered a series of ancient markings littered throughout history, informing them of the origins of mankind coming from the stars, have followed these signs into the depths of outer space to a mysterious planet where they will truly discover where the human race comes from, whilst simultaneously trying to ensure that they actually make it out alive as events unfold that could change the fate of the entire human race. Firstly I feel it's important to address the important matter at hand, and the question that is almost certainly on everyone's minds: a prequel to Alien that isn't a prequel to Alien - what!? 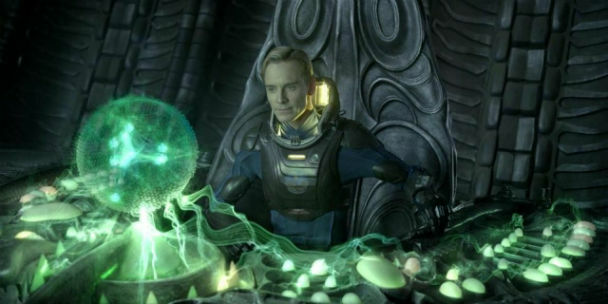 Prometheus is set within the Alien universe, and does contain a number of small moments that relate to the beginning of Alien much later down the line - without any spoilers the film's ending in particular does link to Alien, but not a massive way that anyone who hasn't seen it will be left feeling confused. The rest of the film however is it's own entirely individual story with its own unique characters and aliens. See? A prequel that isn't a prequel! In fact the film itself in my opinion is actually probably closer to a spin-off than a prequel if anything. The obvious result of this means that anyone can watch the film and appreciate it, but those who know a bit more about the Alien mythology will gain a little bit extra on the side. However nor should it be a film that lives in the shadows of Alien, as despite the heavy influence upon the iconic elements of the original Alien used within the trailers and promotions for Prometheus, the film should be seen in many respects as a stand alone film of its own. Along side this though, Prometheus does very much feel like an Alien film. Visually stunning, the film takes the retro vision of the future that Scott envisaged for the original film and presents it with both real life effects and sets, and advanced CGI; allowing Scott to explore more possibilities within the universe he created. The effect of this is rather extraordinary - the film manages to perfectly execute a look that is both true to that of the 70s original yet modern and contemporary to today's audiences who are now technologically 33 years closer to that reality. 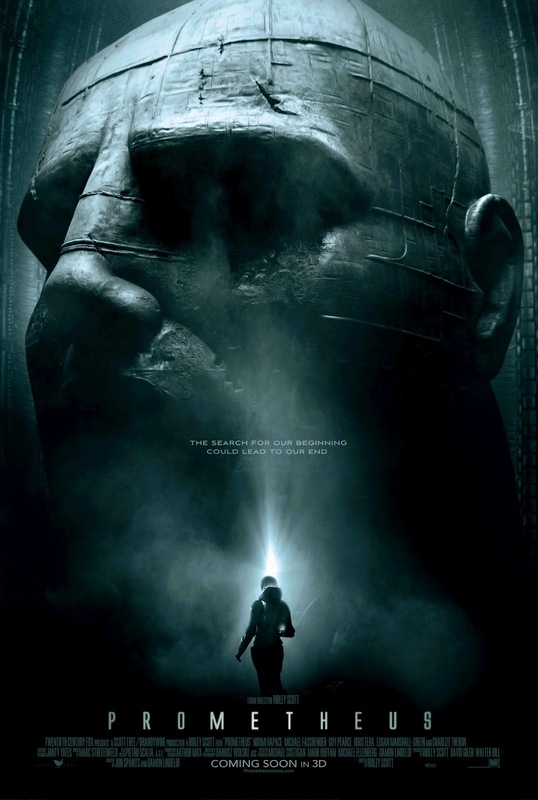 Remaining close to Alien, the tone of Prometheus clearly has Scott's visionary fingerprints all over it as it encapsulates the feeling of spectacle and the escapist futuristic excitement that entertains us as much today as it did in 1979 - mainly brought in through one of it themes of space exploration. In fact a lot of the themes from Alien, as well as a few from Blade Runner, also appear in Prometheus alongside a great number of new themes and ideas based around questions of life, the universe and everything, which lay deep in the background for those who wish to look for them - a sort of 2001: A Space Odyssey for today's audiences. As a result of these ideas and themes Prometheus actually becomes more of a solid sci-fi piece than Alien: which became iconic for its unique horror/sci-fi genre hybrid. Despite this the film isn't without its moments of horror, the emphasis merely lies in other areas even though some of the best moments were thanks to a return this iconic vibe. The Fantastic Mr.Fassbender plays the android David in the visually stunning Prometheus. Of course the film's strengths don't just lie within Sir Ridley's visionary style and direction. There really is no shortage of acting talent with the likes of Noomi Rapace (the original Swedish Girl with the Dragon Tattoo), Michael Fassbender (the fantastic star of Shame), Charlize Theron (who is also currently starring in Snow White and the Huntsman), Idris Elba (Thor) and Guy Pearce (The King's Speech) forming a small part of the overall cast. With Rapace playing Elizabeth Shaw, the film's female protagonist, another character becomes a memebr of Ridley's Angels, with Scott clearly retaining his emphasis on strong leading female characters after Sigourney Weaver's Ripley; a character who debatably changed the image and role of women in film forever. In fact during many scenes I almost felt myself having to do a double take, with Rapaces character occasionally even looking just like Ripley too! Alongside Rapace, The Fantastic Mr.Fassbender continues to prove himself as one of the finest actors around today within his role of the android David (nice name!). Although despite its strengths, Prometheus is not without its problems either. Within the narrative of the film, a lot happens, and I mean a lot - the films certainly feels like its 2 hour running time. Firstly this causes a few pacing issues throughout the film, with a fair amount of scenes feeling longer than they needed to be, especially next to the film's more thrilling faster paced moments; during which the film really gets going. Alongside this the narrative does at times become bogged down substantially with a lot of sub-plots that arguably do not need to be there at all. This includes the prosthetic covered character of Guy Pearce's Peter Weyland, who's character feels unnecessarily aged for no apparent reason (you'll understand when you see him). It's almost as if Scott has grown a bit too attached to a lot of his own personal ideas and has attempted to cram them all into this one film, or maybe his ideas are just so deep and meaningful that they cannot fit within just 2 hours of screen time! Perhaps a second film is what Scott really needed to spread all of his ideas out a bit, in order to allow some of the more over-looked areas to breathe a bit more and for the film to flow a little bit better. Prometheus is now showing in cinemas across the UK.